Have you heard of Stitchin’ Fingers? If you haven’t, I’ll tell you a little about it. 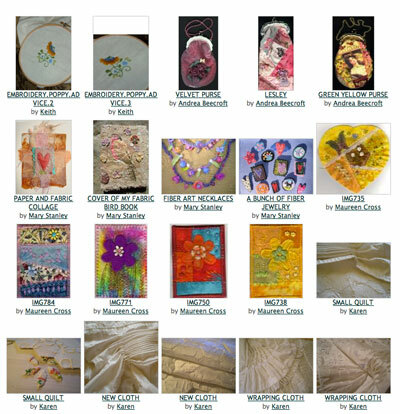 If you have heard of it – if you’re a member or you’ve visited the Stitchin’ Fingers network – you already know that Stitchin’ Fingers is a wonderful source of needlework inspiration and online camaraderie with other textile and needle-arts enthusiasts. 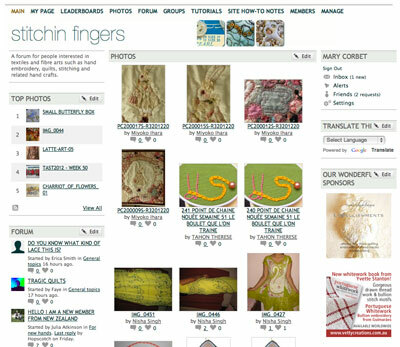 Stitchin’ Fingers was a social network created several years ago by Sharon Boggan, one of the first full-fledged needlework bloggers online, when blogging first came to be. Sharon is well-known for her blog Pintangle, as well as for her extensive embroidery stitch dictionary. She’s an amazing crazy quilter and stitcher. She runs several needlework and art-related classes online every year. Sharon contacted me a while ago with a proposal. Because she wants to spend more time developing her other interests in needlework and art, she is cutting down on her online work. Stitchin’ Fingers is part of that work. Even though social networks seem to run themselves, the truth is, they take time to manage and shape, and those behind the scenes are responsible for keeping things running smoothly. So, Sharon asked if I would be interested in taking over Stitchin’ Fingers. I admit I had to think long and hard about this. Time is a precious commodity, especially when working in the World of Hand-Made. To take a fully grown social network and incorporate it into my work with Needle ‘n Thread was something that required some thought! But I’ve always liked Stitchin’ Fingers. I think it’s an excellent example of a needlework-related social network that remains on focus and that avoids the tendency of many similar networks to become platforms for personal issues and grievances. On Stitchin’ Fingers, textile talk is always the focus. Inspiration abounds in the myriad photos of needlework-related art that are hosted on the network. Discussions and shared experiences in needlework and textiles help like-minded artists and craftspeople learn and grow. It’s a good network, and I don’t want to see it fizzle or disappear. Sharon was hoping that someone with an eye for forming the network, which has grown more or less organically (which is part of the charm and success of it) and with the ability and skills to develop it further would be interested in it, because she didn’t want to see the network close, either. I am flattered and yet a bit humbled that she thinks me capable of the job! Yes, I’ve had experience with online work. Social networks, though? I’m still figuring out Facebook! Still, I love a challenge, and so I agreed to take over Stitchin’ Fingers. Sharon will be helping me get the feel for managing Stitchin’ Fingers over the next month, and in mid-January, I’ll officially be taking the network over. If you’re already a member of Stitchin’ Fingers and enjoy the benefits of belonging to the network, you have no worries! I don’t plan on overhauling and changing things up into to some unrecognizable entity that no longer feels like “home”! Still, I do have some ideas for the network that I plan to develop over time. My goal, as with anything related to Needle ‘n Thread, is to provide you with quality online needlework information, to help you make connections with other needlework and textile enthusiasts around the world, and to promote the needle arts online to the best of my abilities. If you are not a member of Stitchin’ Fingers, I invite you to take a look at the network and join in the fun of connecting with stitchers from around the world. The network hosts many needlework-related groups, and you’re bound to find at least one (if not dozens!) that fits your needlework niche. Due to the doubled cost of running Stitchin’ Fingers – imposed last autumn (2016) by Ning – Stitchin’ Fingers closed at the beginning of 2017. Thank you, Sharon, for your vote of confidence, and for all the amazing work you have done over the years to promote needlework and the textile arts online! And of course, nothing will change here on Needle ‘n Thread. We’ll keep going forward with embroidery talk, projects, instruction, and information! There are several delectable things coming together for 2013 on Needle ‘n Thread, and I hope you’ll stick with me so we can enjoy the new year together! Questions? Comments? Suggestions? (Insights to social networks that you think I should know?!) Feel free to have your say below! AWESOME! I love this and congrats! Mary, this is wonderful news! I am a member of Stitchin Fingers, and was happy to learn from Sharon’s post that you would be taking over. I love your blog and all you do with your website, and I am confident that Stitchin Fingers will be in wonderful stitchy hands. Thank you for being willing to take over the group! Hi Mary, I heard about this yesterday as I’m already a member and Sharon sent an email round to let us all know. VERY exciting – I was thrilled to see that it would be you taking it over … although of course Sharon’s done a fantastic hob so far. Congratulations! I cannot think of anyone else who has the wealth of knowledge of and love for embroidery and needlework who would be capable of taking over from Sharon. I have followed both of your blogs for years; I love the work you both do and appreciate all the hard work that goes into placing that information online. I’m also a rather inactive member of Stitchin’Fingers so its time to go back there and see what is going on! 2013 will be very exciting, and I wish you all the best for the holiday season! You well deserve the success that will be coming your way! Stitchin Fingers is a wonderful site, so inspirational. My Sunday evenings are spent looking through the pictures. What I love about it is that it allows beginers as well. To see perfect embroidery all the time can be a bit daunting and out of reach. I have watched people blossom, including myself. I love learning, so with you and stitchin fingers, it will be a winning combo. Hat’s off to Sharon for running such a wonderful page, but I understand wanting a break to do other things. Congratulations! I think Sharon made an excellent choice. I have been lurking at your site Needle N’ Thread for months now and truly enjoy it. You do beautiful and detailed work – my mother and the nuns who taught me would love you! I look forward to all the beautiful and educational things to come. Mary, I’ve been a member of SF for a while now, and just want to say, Welcome! Although I haven’t participated as much as I would have liked, I’m hoping that will change in the new year. Congratulations! How exciting for you and for all your followers. How exciting! I love Stitchin’ Fingers. I stumbled upon it one sleepless nights just hours after Sharon launched the network. Although I am not currently as active a member as I have been in the past, I still drop in every 2 or 3 days to see what is going on. Sharon has done a great job setting up SF and managing it all these years, she will be a tough act to follow but if anyone is upto the job, Mary, it’s you. Congratulations and best wishes for your new venture. Looks like great fun and inspiration (and possibly a great time killer). Signed up and hope to explore further after the holidays. Thank you for taking on the hosting of Stitchin Fingers! You would have been my first choice too! It just proves what a class act Sharon is in choosing you. I wish each of you nothing but the best! wow congratulations-I may try it again since you are taking over. I was all excited about finding out about that site last summer, so joined. However after I was only there for less than I week I was attacked but one of the members. Had no clue why-Sharon wrote me and said she had no clue why either-but it didn’t stop so I left. I had never had anything like this happen to me-a cyber bully I guess, and that person should have been zapped off the site. That’s awful! Most of the crafting sites have wonderful people who encourage and inspire one another. Obviously they were never taught if you don’t have something nice to say, shut up. Personally, I welcome CONSTRUCTIVE criticism but bullying is just so immature-says a lot about the mentality of the bully. I hope it never happens again. Oh how wonderful this is; I just love all the links you post and Stitchin Fingers is the best yet! I will become a member and can see at least two groups that I will ask to join in the hopes it will inspire me to do more. Thank you Mary!! And I have a question not related to Stitchin Fingers, but to the beautiful ecc, ecclesias, CHURCH embroidery 🙂 you recently highlighted – a European company, but can’t remember the name. During the video, there was a vestment pictured that had embroidered faces on it. Do you know of any sites where stumpwork is combined with faces that I could study? Mary, do you live by a 36 hour day while the rest of us live by the usual mere 24 hours? I just don’t understand where you find time for it all. You absolutely amaze me! I belong to Stitchin’ Fingers but have never done much due to time and I could never figure it out. Maybe with you at the helm that will change. God Speed. It is nice. Congrats Mary. Congrats Mary! I’ve never heard of SF but will check it out in a bit. I really love your site so SF is gaining a wonderful facilitator. Best wishes to everyone at SF and to you,Mary and Merry Christmas to all of us who follow both sites. 2013 sounds like its going to be inspirational! Congratulations! I received notice the other day that you would be taking over for Sharon and was thrilled to hear the news. I have been a member of Stichin Fingers for a couple years and have had the pleasure of meeting Sharon a few years ago at a Crazy Quilt retreat in CT. She is a wonderful and talented lady and I wish her all the luck in her future endeavors. I’m excited for you and also for Stitchin Fingers as I know with your experience and talent you will bring lots of new ideas and inspiration to the forum. I am a daily fan of yours and look forward to 2013. I think Sharon is leaving the group in very capable hands! I’m a member, but have to admit that I haven’t taken an active role in it. I must find time to rectify that! Good luck Mary! That’s a nice compliment to be asked, and a lot to take on. So glad you will not be losing Needle and thread. I enjoy hearing from you. I have learned and experienced so much over the years. hope this is a blessing and not a curse. I am sure Stitching Fingers will be benefiting from someone more level headed and patient. Congratulations Mary! So looking forward to seeing more of you. Well, now, this will be the best of 2 worlds. If she had to do it I can’t imagine a better person to take it over. I hope she still joins in. I really like Sharon. She’s an excellent person as well as stitcher. When I’m stumped for inspiration I rely on her weekly posts for where I always find something new and interesting. I’ve learned so much from her, too. I just went and read her post for today in Pin Tangle. I didn’t realize she was so involved online. That’s a lot of groups to lead and be involved in. Mary, I’m looking forward to your taking over the Stitchin’ Fingers group. That’s a big group, but if anyone can do it, you can. Mary, this is wonderful news. I am a long time member of Stitchin Fingers and am sad that Sharon is stepping back but THRILLED that you are stepping in as her replacement! I am an embroiderer and quilter, who likes to play in the ‘crazy’ world, but the purist in me loves your approach to embroidery. I am sure all the members of Stitchin Fingers will welcome you! Looking forward to wonderful things in 2013. Congratulations, Mary and Thank you. I had never seen Stitchin Fingers but now I have signed up and look forward to new discoveries and friends. It seems a wealth of talent and ideas and I am sure that you will be amazing and innovative. Congratulations Mary,and thanks to SB,SF will not disappear. G’Day Mary. Well, well, never a dull moment in the stitching world. My hobby (I tease Hubby that my hobby really is looking at the stitching magazines and online sites) has just expanded excitingly. I’m ‘into’ Pintangle but haven’t got as far as Stitchin’ Fingers, until now. So now I’m in, reading glasses and all. Oh, and stitchin’ kit! Good on you Mary. I’ll be a very interested follower. That’s great! Congratulations, Mary; I’m sure you’ll do splendidly there at the helm. I just discovered stitchin fingers in the last week and am in awe of all the amazing and talented people and their work. I have been following your blog too for a while now and I am delighted to hear that you are taking over the site. Can’t wait to see what’s in store for 2013. Thanks Sharon for all the wonderful work you have done – I understand the time it takes to keep all this stuff going and I, and clearly lots of others, really appreciate it! Congratulations, Mary! I’m a member of Stitchin’ Fingers and I know you won’t disappoint – am very much looking forward to seeing what your new ideas are. I often wondered how Sharon managed all the stuff she managed and am not surprised she’s needing to make some changes. I do hope tho, that your video tutorials will continue. I can’t learn by seeing a flat sketch or photo of how a stitch is done – must have your videos or I’ll go down the tubes :)because I don’t know anyone in ‘real life’ who embroiders. Mary, I am a not-so-active member of stitching fingers and a regular reader of Needle and Thread. I am very happy that you are now going to be managing it. Let’s have Many happy hours of stitching and embroidery! I’m sticking with you all the way and look forward to the new year with you!!! I’ve not heard of Stitchin’ Fingers, I look forward to exploring the website and joining in the fun. Mary you have my vote of confidence every time, I wish you every success in your new venture. Congratulations! Your website seems to continue to develop a life of its own and only becomes better for the rest of us. Sharon made a great choice and I look forward to learning more about this as time goes on. I’m new to Stitchin Fingers, but will check it out soon. Thanks for the heads up on Stitchin Fingers (never heard of it) and congrats on your new leadership! (you’ll have less time to sew as if you hadn’t thought of that!) Does that worry you? But I’m delighted to start following it! I have really enjoyed Sharon’s site and thought she did a really good job. I am thrilled it will continue with you! On another tact – do you recommend any particular needlework schools in the US? I just signed up for a 2 day class with the Williamsburg VA school. Never heard of SF before but I signed up and found a lovely quilt right away to inspire me and it looks like a wonderful site to see what others are doing. Someone mentioned it’s for beginners too and that’s wonderful. I remember my first embroidery and although it wasn’t too great I felt so good to have accomplished that. Wish I had some people around to encourage me over the years and then I found you online. You’re the greatest. I have improved since that first piece but I have such a long way to go. My biggest fear is the arthritis starting in my hands will get too bad to continue in the future. Thanks for sharing. I joined stitching fingers just to be in the loop. I never heard of it. Believe it or not, I never “talked” to anyone online, that I didn’t know in real life before joining NNT and NP2. I took a leap of faith with Needle and thread. I will watch from the sidelines for a while on the new site. Good luck Mary! Thank you so much for agreeing to be at the helm on Stitchin’ Fingers! You’ll be a fabulous captain I’m sure. Have a very Merry Christmas and wishing you all the best in 2013. I’ve been a Stitchin’ Fingers member for quite a while, but more or less inactive. Mostly because I don’t have a lot of stitching activity to report on. But I do love to read about others’ projects. I wish you much success in the new role! I can surely speak to this one! My first advice to you, Mary, is to ask Sharon to hand-pick a crew of 5-10 moderators/assistants (or at least recommend ’em) that you can count on to take up at least some of the load. I moderate groups over on Yahoogroups, and that has saved my tailfeathers more than just a few times. As for the web-development aspect…find a really, really enthused web person who knows their onions on networking/social media and direct their work to ensure that the ethos of that particular network remains intact and well-directed. Pick the brains over at Ravelry, too– they are quite likely to be willing and able to discuss what they’ve done and how they solved their various issues without going totally insane. It would be nice if it involved nothing but a light touch, but that rarely happens, so LEARN TO DELEGATE, and run SF as a supervisor/director, not as an up-to-your-collarbone frazzled DIY’er, okay? I have not heard of this site before. Not that long ago, I was surfing the internet looking to see if there was a website for embroidery that does what Ravelry does for knitting. If you were to increase functionality of the Stitching Fingers site, I would LOVE to have something like Ralvery for the needle and thread set. First of all, I am an ardent fan of yours & love to visit your page/space/website. Have been a member of few groups on Social Network & the first thing I do is, share your link 😀 I came across your website somewhere around 2007 & ever since, hooked to it like crazy… Tried joining this group “Stitchin Fingers”. My sign up was accepted, but still not a member… 🙁 What could be the reason? Is it necessary to be a blogger or have a link related to this? I cannot join the groups… So, not sure what the problem is. When I tried to activate the membership, from the link sent to my id, I got the message : “NOT POSSIBLE,ACTION FAILURE, ACCESS DENIED”… Would you be able to help me? Hi, I’ll need more information to be able to help you. Can you email me with your name, the email address you used to sign up, the username you used if it isn’t your real name, and then I can do some searching. You can use the contact form here: https://www.needlenthread.com/contact Thanks!